Yana has pronounced stereotypical institutionalised behaviour including consistent rocking, hitting herself on the head and sticking her fingers in her eyes. Daily tablets control the epilepsy but dealing with the repetitive activity needs one-on-one time. There’s a wonderful simplicity in helping to break the habit – exercise, playing, singing – distraction! With the right physiotherapy care and time, she could walk. But the world moves slow for Yana– and it may pass Yana by before she’s given the opportunity. Yana is full of life but lives in a world of silence and darkness. 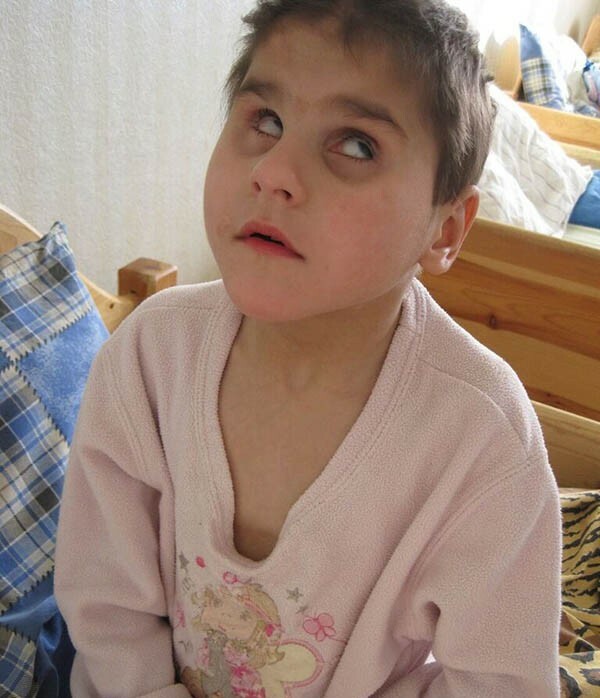 Yana was born blind and non verbal and so, was given up at birth and was placed in a baby home. Soon it became clear she had a number of conditions from severe autism to epilepsy and scoliosis. In time, she arrived at Vesnova Children’s Mental Institution. Due to a lack of resources, being blind in Vesnova means that walking and talking are off the agenda. Particularly due to her blindness, Yana was immediately sentenced to a life where she would be denied the chance to develop. Despite everything, she smiles the biggest smile you’ll see. This Christmas Yana left Vesnova for the first time since the day she arrived there and came to Ireland…where she stood up on her own two legs for the first time, this is why Yana just needs to be given a chance. She might walk, she might stand or she might fall. But she needs to be given the opportunity – even to fall.